From left to right: Bevan Charles, 17 (Freedom High School); Bella Lorenzo-Giguere, 18 (Maret School); Chan Sohn, 17 (Freedom High School); and Andrew Cho, 18 (Freedom High School). We thank our class of 2018 high school interns for playing a crucial role at APIAVote! They spent two weeks with us to complete their senior project on civic engagement and co-led the planning of our AAPI Youth Leadership Summit (July 26-27) in the DMV area. They are part of a movement in which young people are making their voices heard in school, on the streets, and at the polls. They believe that voting is a civil right and ticket to accurate representation in our democracy. And they are doing something about it. Our high school interns shared how young people like them will make an impact on the 2018 elections and beyond, with APIAVote’s Communications and Policy Associate Karin Chan, before they transition into college life. Andrew Cho was not able to participate in this roundtable Q&A. When you talk to your peers, what do they think about voting? Chan: I think they are polarized. There are some students who are active and they have a clear stance on different issues, and they take action on them, especially in my government classes. Then there are other peers who are not engaged at all. The people I see who are active, their families have a strong influence on what they believe and how that causes them to take action. If their parents are active in politics, then so will their children be. People who aren’t interested, I see that those are the parents that aren’t actively engaged in politics. Family has a very big influence. Bevan: For me, I come from the same school. I agree that it’s polarized like Chan said. We did in-school registration through our government classes this year. I feel like some people’s motives for voting are different. I think some people are doing it just so they could say they voted. It’s important that people are actually voting because they want their voices to be heard and make a difference. Maybe it’s because they’re still in high school and they don’t know if they want to be politically active yet but more people should be aware of how important voting is and take it seriously. Bella: I go to a very progressive school. We live in a Maret bubble, and a DC bubble, both with very liberal people. I don’t know if it’s a good reflection of the rest of the country but all my friends are excited about voting. My friend sent our friend group a text about registering to vote. And I sent another text about the registering to vote a few days ago. Everyone in my grade is excited about it. If you aren’t excited about it at my school, it’s frowned upon. Are you eligible to vote? If so, why do you vote? What keeps you up at night that you want to change in this country? Bella: I registered in DC this week, so I haven’t voted yet. But coming up, the most important thing is the minimum wage change in DC. So I’m excited to vote about that. In terms of issues, there are so many. Our prison system needs to be fixed because it’s basically modern day slavery. Ideas about abortion going on are so old-fashioned. If they take away funding from Planned Parenthood and organizations like that, it’s going to be detrimental for women, especially from lower income households. The guns issue right now – there shouldn’t be easy access to guns. We have a gun culture; that’s not a good thing. There’s so much violence. There’s an analogy about how people get hit by cars all the time but they are meant to transport people from place to place. Car aren’t made to kill people; guns have one purpose, and they’re meant to kill people. We also really need to get more women and people of color into public office. This isn’t a voting matter, but our culture of putting women down and not pushing them into positions of power is not good for our society. It would benefit government to have more diversity because you can’t represent people if they’re not part of the decision making process. Also for kids to see they can be in a position of power even if they’re in a community that’s underprivileged. Bevan: I’m not eligible to vote. I’m only 17 but I will register this summer when I turn 18. The issue that keeps me up at night is also gun control. Personally I don’t see it as a left or right issue anymore. It’s the issue of protecting kids’ lives. Last week I told a story about how a girl who used to go to our high school, she’s in college now, she was substituting for a kindergarten class and some kid accidentally dropped a textbook in class, and another student asked the teacher if that was a gunshot. These kids are the future of this country and they have to be protected. The only purpose for school is to learn and better yourself. You shouldn’t have to live in fear every time you walk into school. Because of that gun control is really important to me. I don’t think the second amendment should be completely revoked, like how it works in some cases of self-defense, but guns needs to be regulated a lot more. I know one state banned assault rifles, and I think that’s a big step in the right direction. I hope more states follow that trend. Lives are more important than gun rights. Human life is more valuable. Chan: I know both of them touched on gun control. As students, I think that’s why it’s so important to us because as we see different high schools go through a mass shooting. For me, we are sitting in the same seats, going to the same schools. The fact that those schools have to go through such tragedy at a place where they should feel safe. Right now, certain organizations have a big effect on certain parties. The fact that their money and power are trumping the lives of students is unacceptable. Another thing for me is, it feels like a foreign concept, but affordable college tuition is an issue that affects high school students. I feel like it’s a topic that should be addressed because I see so many students who are intellectually capable and deserve higher education, but end up at community college. Not because community college is bad or lower in any sense but they should be able to receive education that can further their careers and help our country grow. They are the future of our country. It would be a wise investment to push for affordable higher education to help students continue to learn. How can young voters like you make an impact in the 2018 elections and beyond? Chan: For young people, it’s all about the momentum and how young people can be unified as the next generation. The strength in numbers — how so many students are coming together. One of the big movements for the youth right now is gun control. How they can unite together. That’s how they can impact not just 2018 but beyond. Unity around the same issue and how they support one another. How that causes them to be more politically active. They know what’s right. They know what’s important to them. They can come together and bring change. In light of the March for Our Lives movement, politicians have taken note of the strength of youth and the impact they can make. Bevan: I think this is the generation of change. I’ve never seen such activism from kids like the March For Our Lives movement. That was eye-opening because all those kids are our age and instead of doing something else they came out and thought that this was the most influential thing they could do today. The first step is to decide that you care about an issue — as soon as you start to care, you see solutions to these problems. You can start fixing things. It won’t be overnight, but step by step, these problems can be fought by our generation. Young voters have been overlooked in the past, but I don’t think anyone in our generation will shy away from voting. I hope they will continue to realize their voting power. It’s not just about middle aged and older adults but it’s about them just as much. Bella: I was thinking back to the Civil Rights Movement. So many organizations in the Civil Rights Movement were started by students and young people. That has been consistent with social movements in the past. I feel like as young people, we tend to have progressive views. If we get people excited to vote, we can actually make a big difference on what is being argued right now. I feel like anti-transgender bathroom laws and anti-abortion issues are old-fashioned arguments. Young people don’t see those arguments as important. The cost of college education, those are the problems that we’re having right now. Those other issues, they’re just not as important for young people to argue over. It kind of seems like they should get over it and move on. What’s next for you in the fall? Bella: When I start at the Cleveland Institute of Music, I will push my classmates to register and vote in Ohio. I’m going to register again in Ohio and try to organize registration drives and try to bring outside organizations like APIAVote. In conservatory, there are a lot of Asian people. My incoming class is the most diverse class in the school’s history. Bevan: I’m going to University of Virginia next year. It’s really exciting especially when you look at it through a student activist perspective because we saw what happened last year with the Charlottesville riots. And how the anti-protests were led by UVA students. That shows that a lot of the students are politically aware and they want to help make a difference. I think that makes it a lot easier for people to want to register to vote and have their voices heard. Just knowing people surrounding me this year have voices and care about politics. Without our voices being heard, it would be an illiberal democracy. I’m excited that the students going to UVA have an affinity for politics. Chan: I’m also attending UVA this year. What excites me the most is there will be so many perspectives and different people I’m going to meet. These people are coming with different mindsets, different opinions. I just feel like learning from those opinions and shaping my understanding of different issues will be helpful for me. I feel like voting for candidates is more important than voting for parties at this point. Shaping my opinions and views will help me to vote for the candidate with views that are most correct to me. 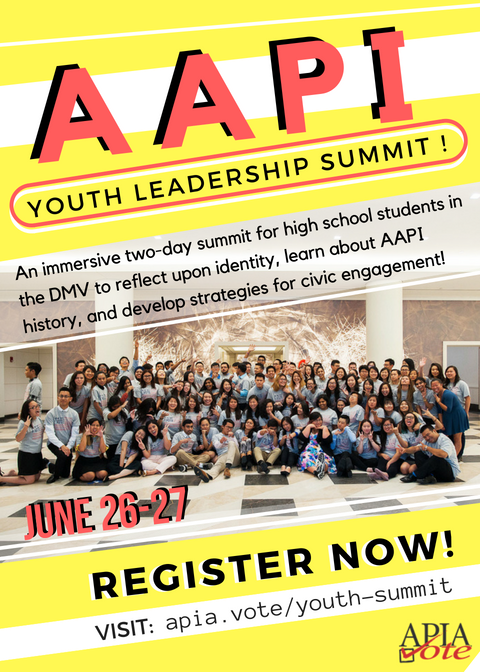 The Youth Leadership Summit (July 26-27) will provide a platform for high school leaders in the Washington DC, Virginia and Maryland area to reflect on the significance of Asian American and Pacific Islander (AAPI) history, share emerging trends in AAPI communities, and develop concrete strategies to promote civic engagement.